Doing what one doesn’t like to do is one of the hardest things for me–and this kind of thing worries me a lot. I joined the missionary work to fulfill my commitment to God for helping me accomplish my college degree. I have the desire to conquer the hearts of people living in the mountain areas, but God has another plan for me. This situation reminds me of Jonah as he tried to run away from the Lord by going to Tarshish instead of Nineveh. With a slight difference, the story seems like mine. I was dispatched to serve in South Korea and everything seems strange and scary in a sense that I am afraid to do the things that I’ve always never wanted to do. I feel like being in a fiery furnace because this is one of my greatest fears–teaching!!! During the few months of staying here in my mission field, I struggle each moment because I don’t have enough confidence in doing the task that was given to me. I absolutely hate teaching or even standing in front of an audience. But then, I realized why God has given me this kind of work: He wants me to be trained in this field for me to be useful in His ministry. As His ambassadors, we don’t have to remain what we are, but rather God molds and qualifies us as we answer His call. Only God knows everything about us. We may sometimes think that we can’t do such things for we don’t have the qualities fit for that task. When Moses was hesitant to go back to Egypt considering his inability to speak eloquently, God told him, “Who hath made man’s mouth?” (Exodus 4:11). When Sarah doubted to conceive a child being in an old age, she was told by God, “Is anything too hard for the Lord?” (Genesis 18:14). With God nothing shall be impossible. If we allow Him to lead our lives then we can see that His guidance is with us. Praise God for His mercy endures forever! I have partners here in my mission field and God is using them to cheer me up. With God, I can make it. 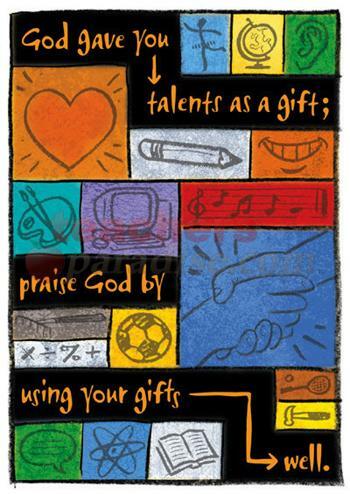 Whatever God has given us, we can use those gifts for the furtherance of His work. By accepting the challenges, we would grow more mature in Him and in the end, we can feel the real joy and happiness in serving our God. At present, I’m still working here as a missionary teacher for the second time. Meeting my students each day and doing every activity with them build up my confidence. It makes me feel useful in God’s service. Doing the tasks given to me each day and trying to do them in the best way I can, with God as my strength and my hope, I continually pray that I may be able to share His love with the people in my sphere. By surrendering our plans and desires unto Him, we can have the satisfaction in ourselves and know the fact that He is in control of everyone’s journey in life. We will never overcome our fear unless we face it boldly with God as our ultimate Source of courage. We all have the gift from God above and the only way to know what those gifts are is by allowing God to lead our lives and to participate in His work of sharing the good news of salvation to the world. Willingness to be lead by God’s will gives us the assurance of our success though we might find it hard to understand the reason of His guidance but by the Holy Spirit’s presence it will be easier to obey… Thanks for sharing dear… God bless and more power!! !